Christmas is a fantastic time of year for fun and games, and if you love playing slots, what better way to have fun than by playing a Santa themed game. If you have been in a workplace environment over the festive season in recent years you probably know all about the Secret Santa. This is where you draw someone out of a hat and then buy them a gift worth a pre-determined amount of money, and someone will do the same for you. Players that play this game will be hoping to pick something up at the end of their playing time as well. This game features a 5 by 4 reel which provides 1,024 ways to win. If you are keen to find a slots game that provides you with more ways to win and more features then this is a game that will stand out for you. The jackpot stands at a total of 115,000 coins while the game can deliver up to a total of 2,300,000 coins – and there is a range of bonus features to look out for, too. With free spins, rolling reels, wild reels, mystery multipliers, and a wild boost all coming on top of the standard game, there is a lot to look forward to. Players should be looking to land five symbols of any kind at any point of the game as this will lead to your five symbols being re-spun when a pay-out is occurring, helping to boost your take home pay. 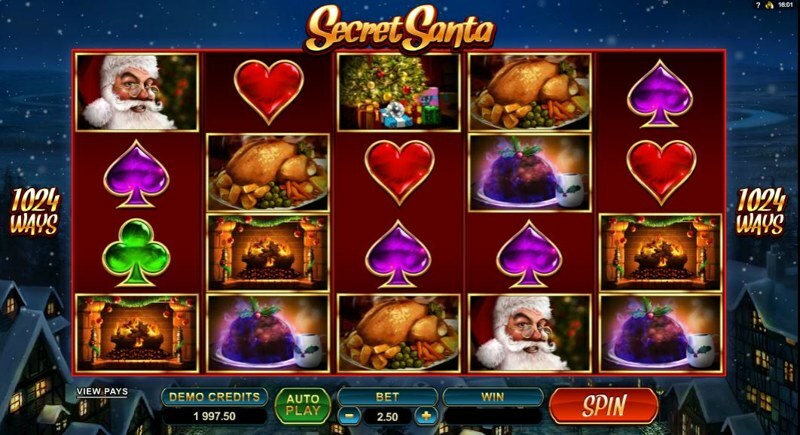 As you would expect from a festive themed slots game, the graphics are very colourful and include symbols of Christmas puddings, turkeys, stockings, a fireplace, a Christmas tree, and Santa. The people behind the game may have run out of Christmas imagery and icons because they have also included a club, diamond, heart, and spade in the icons for the game. The audio features a number of classic Christmas tunes and styles so players will be feeling jolly when they play. Wild Reels will turn up to three whole reels wild. Wild Boost will pick a random symbol and then turn that wild. Free Spins will bag you 5 free spins with a 3x multiplier. Mystery Multiplier will award you either a 5x or 10x multiplier on all wins. Dashing Wilds sees four Wilds land randomly on the reels. Scatter Spree sees all symbols pay scattered in any position and multiplies all wins by the total bet. Rolling Reels will increase the multiplier up to 12x on consecutive wins. Can also award multiple consecutive wins. The Scatter will pay in any position and will also multiply your win by the amount staked. It’s the Christmas cracker you should be looking out for, and we can promise that there will be something better than a paper hat inside. The Secret Santa logo is the wild symbol and will sub in for all other symbols barring the Scatter. In doing so it will create extra winning lines for you. This is as basic as a Wild gets but it’s a welcome addition nonetheless.